Whiplash injury is one of the most common injuries that we treat in our clinic, and one that can be vastly debilitating. It’s very important to have your spine checked following any kind of auto accident. Any body part that’s jarred or thrown forward unexpectedly can sustain microscopic stretching and tearing of ligaments, and the ones that support the head and neck are particularly vulnerable. Since chiropractors specialize in the care of joints, muscles, nerves and connective tissue, it just makes sense to make an appointment for a thorough evaluation following a collision. The Society of Automotive Engineers has pointedly stated that there is absolutely no relationship between vehicular damage and bodily injury. In fact, research demonstrates that more than half of all whiplash cases occur when there’s no damage to the vehicle at all. Dr. Michael Gazdar has extensive experience in the detection and correction of Walnut Creek auto accident injuries. 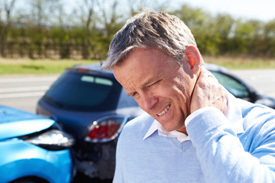 He has been the recipient of advanced certification courses in the medical and legal aspects of whiplash injury and is highly trained in all areas of auto accident trauma. What Are the Symptoms Related to Walnut Creek Auto Accidents? Research and our experience in 25 years of treating auto accident victims demonstrates that many people don’t manifest the symptoms of a car crash until weeks, months or even years later. It’s always wise to be proactive with your health and avoid the potential pitfalls of a chronic condition. If you experience any of these symptoms, it means that structural damage has taken place. It’s important to correct all misalignment as quickly as possible so that the body, as it undergoes tissue regeneration, will heal in optimal alignment. Unfortunately, insurance companies don’t understand that injury-related symptoms can remain hidden, without manifestation, for many weeks or months. This is why it’s important to have a chiropractic checkup before the common 14-day statute of limitations mandated by many insurance policies today. We will also work directly with your attorney and require no out-of-pocket expense from you. You can count on our years of experience in auto accident-related treatment! Have you experienced an auto accident in Walnut Creek? Contact us at (925) 939-2225 today!